In NYC, the ERB’s ECAA®(WISC-V®-based) is administered to students entering independent schools, grades 2-4. This workbook is also sold as a part of our Complete WISC®-V Bundle! 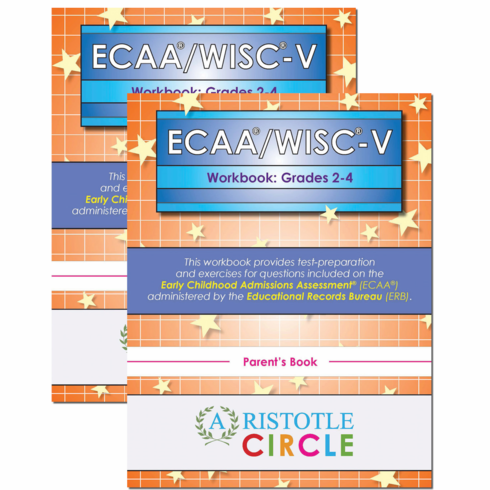 Our ECAA®/WISC®-V Workbook for students entering Grades 2-4 provides practice for children so they can become accustomed to the types of questions included on the Early Childhood Admissions Assessment® (ECAA®) administered by the Educational Records Bureau (ERB). For students entering grade 2, the ECAA® includes subtests adapted from the WISC®-V assessment. For students entering grades 3-4, the ECAA® also includes a Reading Comprehension section, which is included as a section in our workbook. If your students are currently in 1st, 2nd or 3rd grade and is applying to 2nd, 3rd or 4th grade at an independent school, then this is the book you need. A Parent’s Book with thorough subtest breakdowns, administrative instructions/prompts, answer charts, and answer explanations. A corresponding Child’s Book with 400+ questions throughout the 11 ECAA® subtests (ages 6-16). Verbal subtests Similarities, Vocabulary, Information, and Comprehension. Nonverbal subtests Block Design, Matrix Reasoning, Coding, Figure Weights, Picture Span, and Visual Puzzles. A Reading Comprehension subtest for students entering grades 3-4. Bi-colored blocks for use on the Block Design exercises.